Homes are built for people, not paper, and yet it seems we dedicate much of our residential space to storing old paper documents. If you work from home or regularly receive mail with sensitive personal and other information, you’re bound to have stacks of sensitive business documents laying around the house. Even if your job is not based at your home, you probably still have boxes of paper stored in your garage or attic that you can’t toss in the garbage. When you’re ready to open up some space and properly dispose of your documents, residential mobile shredding is the way to go. There are clear advantages to using a mobile shredding service at your residence but first let’s discuss what exactly mobile shredding is and how it works. With a mobile service, shred trucks equipped with industrial shredders come right to your door step. The shredding is done right in front of you guaranteeing everything is properly destroyed. The industrial shredder can destroy up to 7,000 pounds per hour, meaning no matter the size of the job it will be done in a timely manner. If you have ongoing shredding needs, a contractor can provide you with secure locked bins to store your documents at your home. A shred truck arrives at the scheduled time and removes your documents from the secure bins. For one time purges, your documents will be gathered and taken to the shred truck. The documents are then sent through the shredder. All the shredded bits get stored in a locked container inside the truck. You will receive a Certificate of Destruction that details the amount shredded as well as the chain of custody, date of shredding, and the name of the professionals who completed the shredding for you. The truck returns to the facility with the shredded documents where the paper bits are baled and recycled. Mobile shredding is secure and simple. All you have to do is schedule an appointment and a truck will come right to your residence and shred all your sensitive documents. Imagine having a garage or space in your office again for things other than filing cabinets and letter boxes—all it takes to quickly clean out that space is a residential mobile shredding service. 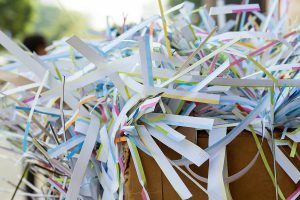 When it comes to residential shredding, you have many service options that all come with their pros and cons. Two of these options are mobile and drop off shredding. With drop off shredding there are thousands of nearby locations across the nation where you can drop off your documents for shredding. You simply place your paper into a locked bin at the store and then a shred truck takes the paper from the bin for shredding on a regular basis. The list above gives some general benefits for each service, but let’s look a little deeper at some of these advantages. The main benefit to a mobile service is the shredder comes to you. It’s important though not to assume mobile shredding costs more simply because the truck has to drive to your residence, as price is largely dependent on the volume of shredding. If you don’t want to bring all your paperwork to a drop off site, a mobile service has a clear advantage in convenience. When it comes to cost, both services are economical. Drop off locations on average charge $1 per pound which for smaller jobs is affordable. However, if you have more than a few boxes, a drop off location could get costly. A mobile service charges around a $100 for up to ten boxes (300 lbs). If you have anywhere from three to ten boxes, using a mobile service is comparable financially to a drop off site plus you get the convenience of having the shredder come to you. The final gain a mobile shredder has over a drop off site is the ability to watch the shredding. With a drop off site, you cannot witness the destruction of your documents. If you want to witness your documents be shredded, a mobile shredder is the better choice. Beyond the material discussed above, drop off and mobile shredding offer many of the same advantages. With both services, you will receive a Certificate of Destruction. You’re documents will also be stored in secure locked bins no matter what service you choose. Overall, both options are secure and affordable. 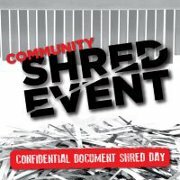 Another factor to consider for mobile shredders is their ability to hold a community shredding event. If you have paper that needs to be shredded, your neighbor probably does too. Having a mobile shred truck come out to your community is a great way to spread awareness of identity theft, offer secure shredding to the area, and build stronger neighborhood connections. Many shredding companies offer shred events to the public. Depending on the company, people may only have to pay a small fee or make a donation to a local charity to get their shredding done. Most events are hosted in large, accessible places such as the parking lot of a local shopping center. If you cannot find an already scheduled event, you could start your own. A mobile shred truck only cost about a hundred dollars to come out and will shred up to ten boxes. If you don’t have that much to shred, why not invite your neighbors to shred their paper as well and then split the cost. Mobile shredding, drop off, and community shredding events are a great way to handle your home shredding. Shred Nations can help you find a shredder to come to your neighborhood and we can help find local drop off locations near you as well. If you need residential shredding, we have a nationwide network of contractors that can help you to shred your documents at your home. For more information or a free no obligations quote, give us a call at (800) 747-3365 or fill out the form to the right.